Just some thoughts about the call for more technology, encryption, pen testing, etc. 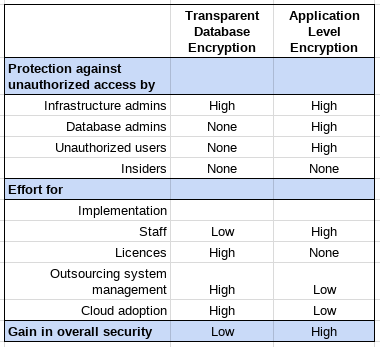 The big question is: Would database encryption have slowed down or stopped the attackers? From my experience with Transparent Data Encryption (TDE) in the Oracle universe I can only answer: Definitely Not! If it’s properly set up TDE works very well to prevent unauthorized access to data in rest. Administrators and users are not able to read or copy database files when e.g. the database is shut down. But as long as the database is started TDE works transparent for all users and the administrators: They can access the data with applications or SQL tools without any restriction. If you like to keep the administrators away from the data you must set up Oracle Database Vault on top of TDE. Database Vault acts as a firewall between the users and the administrators. Administrators can run their administrative tasks, but they could no longer access the data. In addition, the Separation of Duties principle is enforced for security critical operations like definition of users. But what’s about malicious insiders? Malicious insiders are responsible for about two-third of all attacks, but neither TDE nor Vault would stop them from accessing all data. With Label Security a fine-grain access control system is available that gives data admins the opportunity to restrict a user to individual data sets in a table. Sounds like rocket science, doesn’t it? Far from it. Most of this products are for several years in the market, but they are widely unknown, and, the effort for implementation is high. This entry was posted in New Technology, Puzzling discussions, Survival tips and tagged Administrators, Anthem, database encryption, Database Firewall, encryption, Label Security, Separation of Duties, SoD, TDE, Transparent Data Encryption, unauthorized access, Vault on February 19, 2015 by Klaus Jochem.